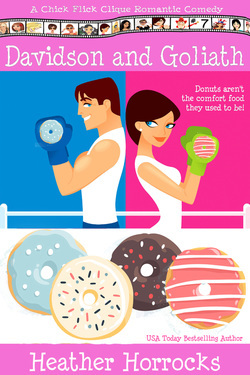 Small donut shop owner Dani Davidson despises the national chain shop that just opened across the street from her family's Holier Than Thou Donuts — and that includes Mac MacKinnon, the handsome devil instrumental in putting Goliath there. She seeks advice from her friends and online penpal, Patrick, who is sympathetic to her plight. Mac just wants to make a difference in this new town, put down roots, and maybe find love. Things really heat up when the community splits down the middle to support one or the other of the combatants in this hometown native vs. newcomer, status quo vs. progress, love-and-war match between Davidson and Goliath. Love, honor, cherish, and obey? Not on her life! Feisty wedding photographer Sonnet Cassidy is not about to let anybody else tell her what to do — especially not her bossy governor father. He takes the choice from her, however, after receiving a threat on her life, and overreacts by arranging round-the-clock, in-home FBI protection. Agent Derek Strong is no more thrilled with his babysitting assignment than she is, and the resulting attraction is extremely inconvenient for them both. Will they work out their differences before they kill each other — or will someone else beat them to it? The 'Czechs' are starting to bounce! When Vicki's many-times-married cousin Manny brings his Czechoslovakian mail-order bride to the Who-Dun-Him Inn for their honeymoon, he never planned on being arrested for murder less than twenty-four hours later. Is the bride as innocent as she claims? Or is she somehow involved in the crime seemingly swirling around her? And what’s with all the Slavic mafia-type characters suddenly hanging about? These three books make up the process by which critique and plotting partners Heather Horrocks and Diane Darcy plotted over 75 books in a one-book-in-a-day pattern. The process is now written down in an easy-to-understand way and ready to be shared with other writer friends to help their plotting process.